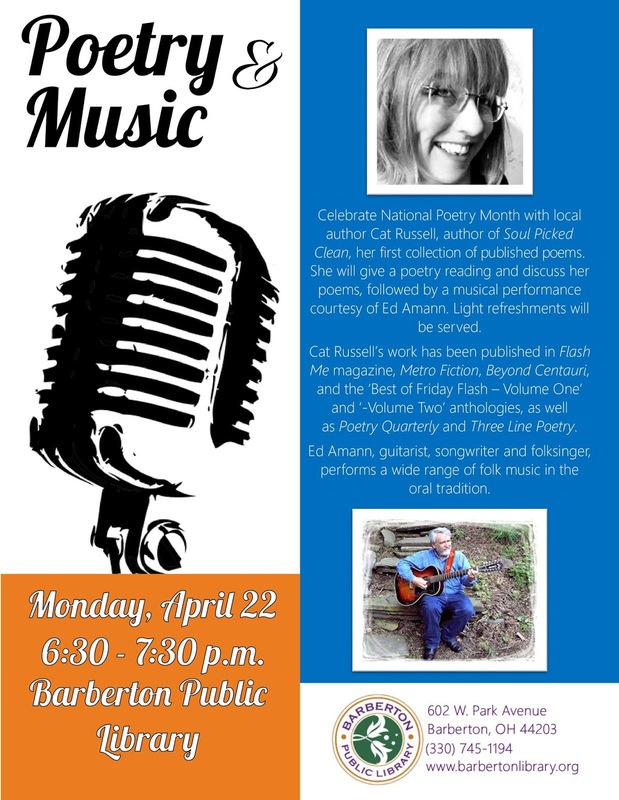 4/22 in Barberton, OH - Cat Russell author talk with music by Ed Amann at the Barberton Public Library. 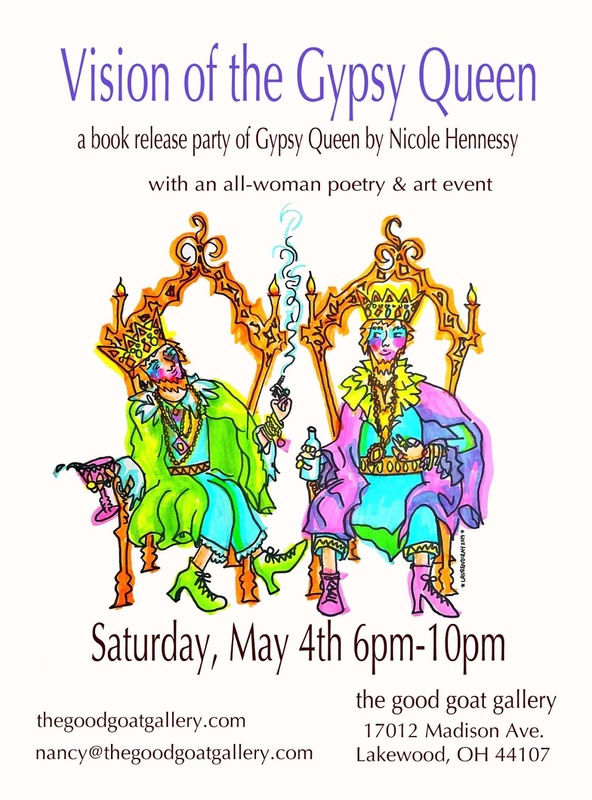 4/24 in Palm Springs, CA - A Night of Poetry and Art with Alex Gildzen. 4/30 in Worthington, OH - Rikki Santer & Jennifer Hambrick at The Light of Seven Matchsticks. 5/4 in Lakewood, OH - Vision of the Gypsy Queen featuring Nicole Hennessy's book launch. 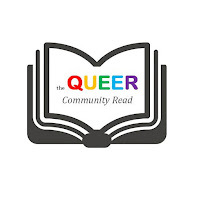 Join in a lively discussion with regionally and nationally known poetry publishers on Saturday April 13th at the South Euclid-Lyndhurst Branch of the Cuyahoga County Public Library. 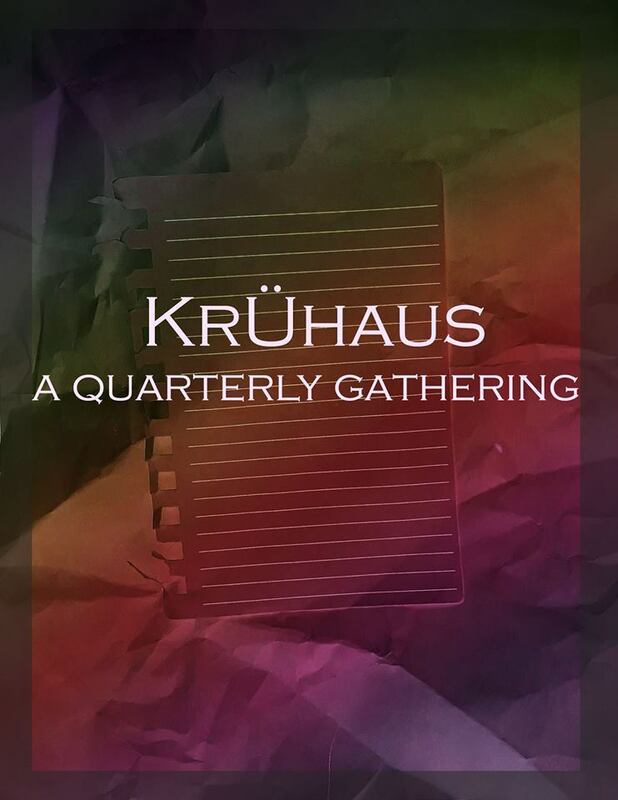 Representatives from Bottom Dog Press, Cleveland State University Press, Crisis Chronicles Press, NightBallet Press, Poet’s Haven, and University of Akron Press will share their thoughts and insights about publishing poetry and answer questions from the audience. Moderated by Bonné de Blas, an MFA Candidate in the Northeastern Ohio Master of Fine Arts program at Kent State University. Enjoy free refreshments while you browse the book fair, talk with local publishers, and check out their publications. Several authors published by presses in today’s roundtable will read from their work. Books will be available for purchase and signing. Readers will include Phil Metres, Ray McNiece, Rikki Santer, Holli Rainwater, Robin Mullet, Larry Smith and more. Browse the book fair, talk with local publishers, and check out their publications. This event is FREE and open to the public. Please RSVP at http://attend.cuyahogalibrary.org/event/1408538. 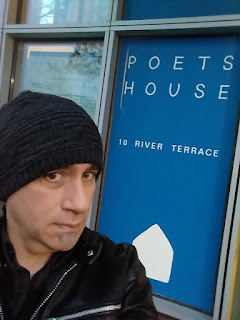 All of our recent (2018-2019) Crisis Chronicles Press​ titles will be featured in the 27th Annual Poets House​ Showcase in New York City from June 27th through August 17th! and whatever else I might get done in time. Most of our earlier titles are also in their permanent collection. O Captain! My Captain! Excited to learn that one of my poems ("Allen Ginsberg Wants You") will soon appear in Poets to Come, the Walt Whitman bicentennial anthology - and I've been invited to read at the Walt Whitman Bicentennial Convention (May 31 thru June 2) on Long Island, NY. This has been on my mind for several months, and off and on for longer than that, but I've kept waffling and putting off the announcement because I wasn't sure, and I wanted to keep my options open (including the option of changing my mind) and I didn't want to dampen enthusiasm for our forthcoming books or upcoming events. But I am shutting down Crisis Chronicles Press (or at least placing it on hiatus) at the end of this year or after we have fulfilled our current publishing commitments, whichever comes first. We still have a lot of work to do, as we will be publishing ten excellent new books in the near future, participating in a ton of book fairs and other events, and keeping most of our catalog in print indefinitely. 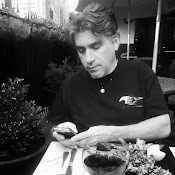 When it's done, I may still work part time in publishing, or reserve the right to do a random unanticipated Crisis Chronicles Press project here or there. But life is short and there are many more things I want to do, including focusing more on my own writing and perhaps completing my memoir and not spending every moment thinking about all the things I have to do or catch up on with seemingly no end ever in sight. I am super grateful for all the interest and support the press and I have received over the past eleven years. And what an honor and privilege it is for me to have worked with (and continue to work with) some of the best writers in the country (and several from other countries) and many from right here in Ohio. 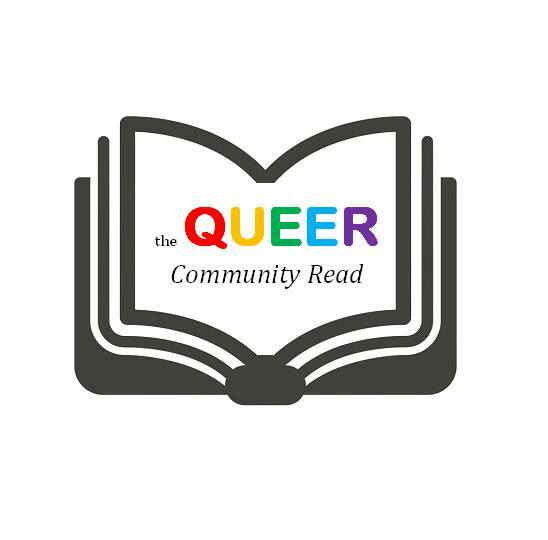 You're gonna love the new books we have coming out by Nicole Hennessy, Carolyn Srygley-Moore, Chansonette Buck (with Jillian Mardin), Alex Gildzen, Lisa Cihlar, Nick Gardner, Julie Marchand, Kent Taylor, Christopher Franke, D.R. Wagner.... And there may be a surprise tossed in as well. I love you all. 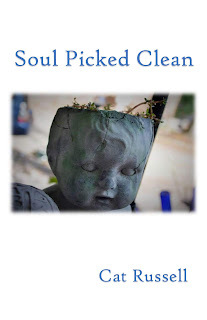 Everyday life is the source for the poetry in Cat Russell’s collection Soul Picked Clean. The provocative title of her opening poem “Why I Can’t Tell You About My First Time” refers to her first library visit, which Russell can’t recall but which instilled in her a lifelong love of reading, leading to visits to high school and college libraries. The delicate “Urn” depicts the poet’s mother seated in her “tastefully decorated office” selecting a cloisonné urn to contain the ashes of her husband, to keep him close by. “Panic” ably describes the uncontrollability of a panic attack and how it feeds on itself, and “Gathering” the prosaic childhood memory of Russell’s father and his friends relaxing poolside with beer and chips. Some of the poems were previously published. Soul Picked Clean (89 pages, softcover) costs $12 from Crisis Chronicles Press, 3431 George Ave., Parma 44134. Cat Russell will be joined by Pittsburgh poets Jen Ashburn (The Light on the Wall) and Jason Irwin (A Blister of Stars) at 7 p.m. Saturday [3/30/2019] at Mac’s Backs, 1820 Coventry Road, Cleveland Heights. 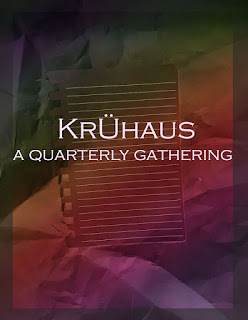 One last reminder: I'll have the honor of sharing the stage with some amazing writers from all over the place this Friday during Kruhaus: A Quarterly Gathering at Hooked on Colfax in Denver, hosted by Kleft Jaw Press. 7:30 p.m. Many thanks to Pudding Magazine: The Journal of Applied Poetry and editor Connie Everett for recommending two recent Crisis Chronicles Press books in their latest issue. Subscribe to Pudding at puddingmagazine.com. "There is plenty of heft and whimsy in the poems of Rikki Santer. Besides her obvious love of language and its play, she ruminates over failed relationships, environmental peril, internet addiction, health scares, and death. But there is also a well-balanced celebration of music, art, and nature to appreciate. Betty Boop is reconsidered as only a feminist might. A food and art mashup with appearances by Picasso, Gertrude Stein, Stephen Hawking and abstractions of culinary possibilities leave the reader dizzy. Reading Santer's poems is an experience of synesthesia as she navigates the 'thin membrane between apocalypse & carnival.' 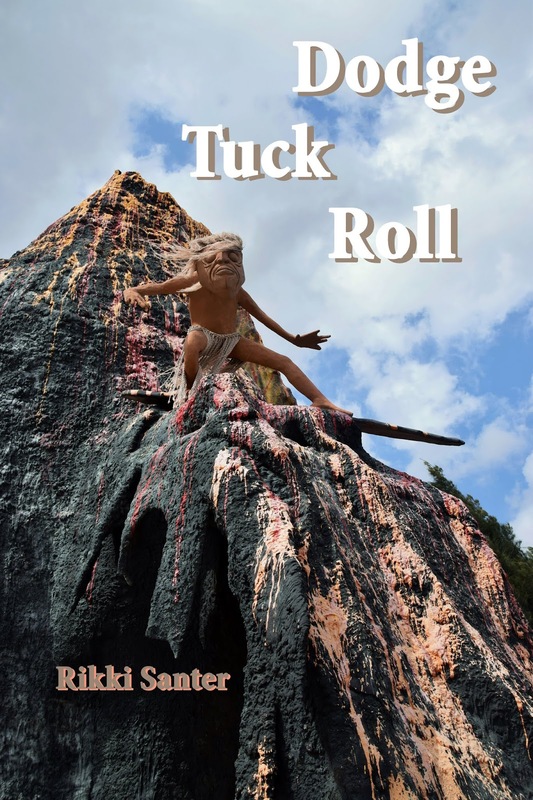 Dodge, Tuck, Roll is a book to be savored." "After decades of war, many of us don't know any who have served or their families. Gunter-Seymour gives an emotionally honest portrayal of what service and sacrifice look like for military families. A sense of home, of place, offer context for what we protect and why. A book of heartbreak, but most of all, love." Order Rikki's and Kari's books together and save!